by Mari Robeson in Make & Create! 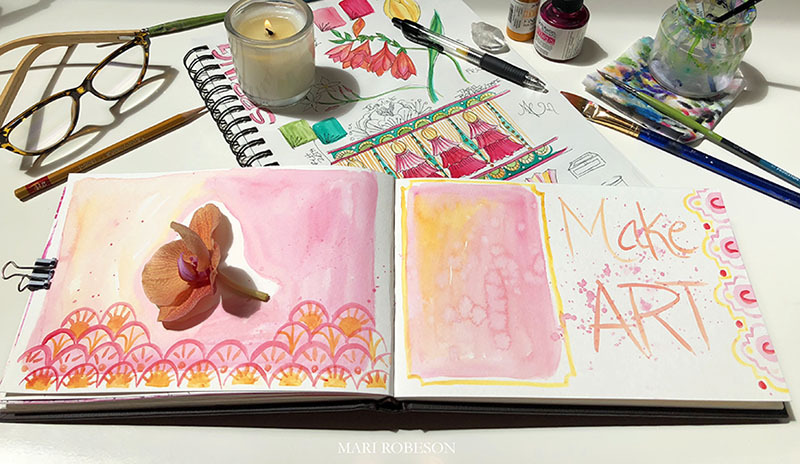 I have so much I want to share with you on how you can unlock your hidden artist and find joy in the Art of Creative Journaling! I've been any artist my entire life but it was when I went to college that I began the ritual of filling a large black journal every year. Let's just say college was, a-hem, a few years ago when Prince and Madonna were giving us all life. Every year since then I've created a journal. I can’t see that ever changing. The mixture of creative play along with putting pen to paper is one of the quickest ways to get in touch with your deepest thoughts and emotions. That said, it’s not always pretty and sometimes quite messy and maybe even a bit sad, pretty reflective of life don’t you think? The greatest thing about journaling is that it’s just for you. It’s a completely safe place for you to write your feelings and paint your ideas. It’s a place to add pictures that inspire you and doodle when you are feeling stuck. Sometimes my pages are full of just writing while other pages are full of my sketches, paintings, and ideas. The beautiful thing about Creative Journaling is that any one can do it! Once you begin the process you will experience more clarity and find peace within yourself in a new, exciting way. 1) Choose your journal: First think about how you want to use your journal. If you mainly want to write and sketch then you may like the Canson Black Spiral Journal I use. I like the large size but it comes in several sizes. If you want to primarily paint and use mixed media then you may prefer Strathmore or Moleskin watercolor journals. I have both. I use a small Strathmore watercolor journal for when I’m traveling along with a Windsor & Newton travel paint set. These went with me all over Italy and back! You may want to browse the isles of your local art store and select one that feels best for you. 2) Art Supplies: Some of these may seem obvious but here is a general idea of what you’ll need. Pens, Paintbrushes. I like Artist's Loft Synthetic Brushes, Paints: Watercolor - trasparent - fluid, Acrylic & Guache - opaque and more saturated color, Stamps, Ink, small spray bottle of water, Gesso, Tissue Paper. I could go on and on because you can literally use anything that will stick to paper to play with in your journal! In my Creative Journaling Playshop I explain more about how you can use each of these mediums. 3) Conquer your inner critique: It's easy to feel overwhelmed when staring at a blank sheet of paper but the great thing about it is, this is for your eyes only unless you choose to share it. So To Begin - Just Begin! Let go of all outcome and let your words, paint, or pencil flow across the pages without judgement. 4) Find inspiration: Once you get into the practice of creating journal pages you will start to see things differently. Anything can become inspiration! If you are just getting started I would suggest you start with taking a walk in nature. Yup, just take a walk. Nature is full of inspiration. Connecting with the pure vibration of nature with an open mind is one of the quickest ways to jump start your creativity. There are also many creative art and writing prompts you can explore. I talk more about those in my Playshop. 5) Create your background pages: Sometimes if you "just aren't feeling it" you can start with something as simple as creating background pages. You might want to mix paint colors on your pages and come back to them later when you want to write or collage on top of them. 6) Words: I love to play with words and quotes. Draw them, cut them out of magazines and make a collage, layer them on top of of your background pages or write a word and just doodle around it. A simple writing prompt is to answer the question "I Am____________" with several answers. Artist, author and friend Christine Mason Miller, aka SwirlyGirl, writes about this in her beautiful book, Desire To Inspire. 7) Draw simple shapes: Even if you say you're not an artist, just about everyone can draw repeating circles or triangles, squares that interlock, etc. I'm personally a fan of "dots" they show up quite often in my paintings. 8) Mixed Media: This is one of the funnest ways to journal because you basically are playing with all kinds of materials. One of my favorite things to do and very simple, is photocopy or print out an image in black and white and then paint it, or add whatever else speaks to you. 9). Try looking at it a different ways: I take lots of breaks when I'm painting pages and have found it helpful to step back and look at the design. You can even turn your pages. Sometimes I will take a picture on my phone and look at how the camera captures the design. 10) Take your time: Set a time that will consistently work for you. I like to journal and paint in the late afternoon. It’s my way to unwind at the end of the day. You can see my daily paintings on my Instagram. I started it as the 100 Day challenge, which I've now done three times! It's become a habit that I look forward to every single day! Some of you may choose to journal first thing in the morning. I will do that as well as a way to sketch out what my day will look like or write about something I'm trying to process and figure out. Author, Julia Cameron wrote the most amazing book 25 years ago that is still relevant and helpful, The Artist's Way, where she talks about the power of morning pages among many other wonderful insights. I truly hope you will give it a try! Put on some great music, light a candle, pour your self some tea, coffee, or a glass of wine and have fun! A Little Behind The Scenes With Palette Arts! 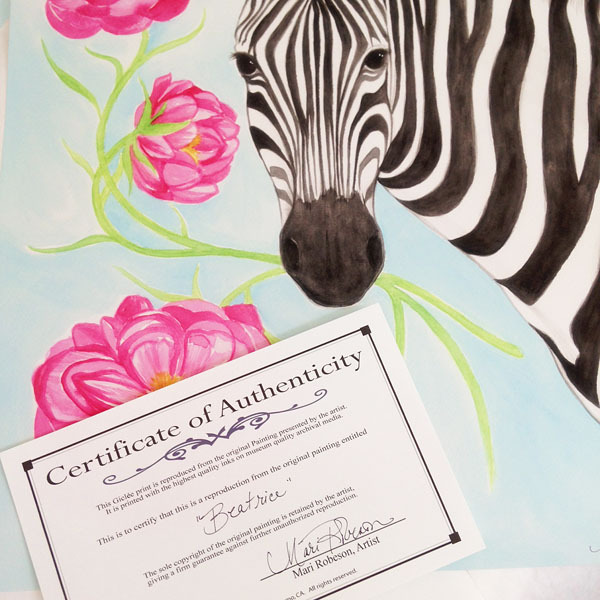 "Beatrice" with her Certificate Of Authenticity Available Exclusively At The Pink Pagoda. Yesterday I picked up several prints to be sent off to their new homes around the country. I'm so fortunate that one of the best printers in the USA is right here in California and is only 15 miles from me. This is really an amazing story because when I started the process of selling my artwork I looked all over the world! I had samples from China and other overseas countries but the quality of the canvas just wasn't there. At the time it never occurred to me to look in California so unfortunately I did it the hard way. Finally looking and finding the best right in my own back yard! So if you are an artist looking to reproduce your work let me tell you I've already done your homework and if you want the best quality for your images I highly recommend Palette Arts! I simply adore Les and his incredibly attention to detail. He's one of the most meticulous graphic designer & printer I have ever met. He has extensive knowledge in his field as well as web design and social media. What really resonated with me is both of our commitment to the highest quality available for the products we produce. My art prints are printed on premium heavy weight watercolor paper with colorfast inks that last 100 years. It's truly museum quality at it's highest level. You can read more about his process here. I want to thank everyone who has ever ordered an art print or giclee from me! Your patience in this process is greatly appreciated and I want you to know that I have searched high and low to bring you the best product made in the USA! Thank you so much for supporting the arts and small business in California. I am deeply grateful! One Room Challenge - Week 4 - Studio Refresh! by Mari Robeson in DIY Design Tips!, Delish Decor!, Interior Design, Make & Create!, New News! Week 4 of the One Room Challenge started off with a pleasant surprise. My "back ordered" desk arrived on Monday! It was the funniest thing when I saw Emilie of Shell and Chinoiserie post on Instagram that her Same Exact Desk arrived on her porch, at the Same Exact Time mine was delivered in California! C-R-A-Z-Y! BTW I LOVE the Desk! My husband had it all put together for me when I got home & I couldn't be more pleased with it. I have to back track just a little though. This One Room Challenge was incredible inspiration for me. I spent a few days, literally, Spring Cleaning like a crazy woman! I cleaned out my closet, my girl's closet, my storage room, my garage, my laundry room AND MY STUDIO! We donated a truck load to Good Will and found all kinds of things that had been missing! So Thank You Calling It Home because I'm not sure if I would have done it without this fun challenge! This week I also purchased all the frames for my gallery wall and the other supplies I would need to make my "Heart Of Gold" design work. I prepped the wall and made my heart template out of some left over cardboard. I also found this painting in my storage. I painted her over 20 years ago. The painting is called "Forgiveness". It was part of my first ever "One Woman Art Exhibit" in San Luis Obispo & later, San Francisco. I was right out of college and ready, but terrified, to show my work as an artist. It reminds me of where I came from on this long journey as an artist and a designer. So out she came and up onto the wall again. As an Interior Designer (my day job) I always tell my clients to buy art that makes them happy, or tells a story. I also want them to know about the artist and what the inspiration is for their paintings. I find that so much more meaningful when a home is designed with that kind of attention to detail and support of the arts. The cat I found cleaning my studio and brought back such happy memories of when my girls were little. I just had to give her a coat of Gold! And other items received the Midas Touch this week as you can see! I was thrilled to find my card holder shelves in my garage! Another Perk of Spring Cleaning! I had these in my boutique years ago and can't wait to use them again to organize my greeting card line. And the knob update. Yes, I painted the existing ones Gold & No I'm not sure if I'll keep them because I am still on the hunt for ones that I really love. I'm also still hunting for a rug. Today I'm going to purchase a black and white striped one to try out. Next week I hope to finish my gallery wall & find the perfect accessories to finish it off! Please make sure to check out Calling It Home & all the other amazing blogger/designers making beauty in the world! by Mari Robeson in DIY Design Tips!, Delish Decor!, Interior Design, Make & Create! Week 3 of the One Room Challenge was full of Ups & Downs...literally, lights went Up & old artwork came Down! I spent a good 2 days cleaning out my studio. Talk about some spring cleaning! After everything was rearranged, dusted off, and looking good again, I took down the old art I had on my wall to get ready to prep and paint my "Heart Of Gold". Grrrr.... bummer #1. I had forgotten about some adhesive stickers that were still stuck to the wall from a former bulletin board. Ugg! So off to the garage to find my Goof Off! I'll be tackling that in the days to come. The good news is I have light! I had to tackle a wiring issue and it was well worth the wait! Two sparkling sconces! I love them! Check mark that off the list! This week I also ordered my desk! But, Bummer #2, it's on back order! Hopefully I'll have it in time! The price was reasonable. I looked at quite a few and since it's just going in my home office, this one did the trick. Right size & right color! My current table has served me well and is now photographed and ready to find a new home on Craigs List. Next on my list is knobs! Being so darn busy, I never finished putting all the hardware onto my filing cabinet! I'm not quite sure what I'll do with the old hardware but it just may involve a can of Gold Paint. We shall see what inspiration sparks me over the next few days. If that doesn't work out, these are a few I fell in love with this week. Check out all the other fabulous One Room Challenge Makeovers over at Calling It Home! You'll want to check out all these talented ladies participating in the One Room Challenge! One Room Challenge - Week 2 - Studio Refresh! As I mentioned earlier my studio is in my attic. The ceiling comes in at different angels which gives it character but also creates challenges. It also has a funky access door to the right. As I see my fellow bloggers making great strides with their make overs, I find myself staring at this awkward wall and stacks of paintings trying to figure out how to make it all work. So here's what I've come up with. I'm going to paint a large Gold Heart on the wall and select 18 of my favorite paintings to hang. I've created this template to scale. Feel free to use it for your personal use. I narrowed down some of my favorites but there are still cuts to be made. Boo! Make sure to check out all the design make overs at Calling It Home! Hello Gorgeous! & Hello March! FREE Desktop Download! Well you are Gorgeous! I've teamed up with District17.com this month to create a fun & FREE download for your devices! This design is inspired by my Lipstick Print & Lipstick Pillow! Please feel free to share and enjoy for your personal use! If you'd like to share on your site please give credit back to muah. xoxo Enjoy! Happy March! Love Is Free & So Are My New Print-ables! by Mari Robeson in DIY Design Tips!, Kid Spaces!, Make & Create!, New News! I've teamed up with two of my favorite retailers Rosenberry Rooms & District 17 to create 2 new printable Valentine's Banners for you to download and enjoy for your personal use. As an Interior Designer I'm contstantly sourcing product for my clients. Rosenberry Rooms has an incredible collection of home decor for the little ones in your life, including my collections as well. Yay! They are the nicest people to work with and the first place I would look to shop for a wide range of children's decor. District 17 is their new sister site for your teen or college student. They carry everything you could possibly need for the most stylish dorm room! I'm thrilled that they carry my product there as well. With their curracted collection of designers, it's some serious company to be in! Please enjoy both of these downloads and feel free to share with your friends! You can purchase my Kiss Me Print here and ELovephant collection here. Download Rosenberry Room's ELovephant "Be Mine" printable here. Download District 17's "You, Me, Oui!" printable here. The Perfect Little Hostess Gift! With all the parties happening this time of year I always make sure I'm stocked up on Hostess Gifts! When in doubt, you can always give flowers! Everyone loves to get flowers! This year I've been wrapping my flowers with my New Pineapple Party Tea Towels! We all know it wouldn't be a party without them, right? So let your host or hostess know their appreciated! Pineapples mean "Welcome" & "Hospitality". They used to be quite rare, once only seen among royalty. Bloggers, at TwoChums have a super explanation of the history of the Pineapple in Home Decor. I'll be posting this week about all the fun things you can do with a Tea Towel! You can stock up on ours here. FREE Gift Tags! Merry Christmas! I'm so excited to be able to offer you our Free Download Gift Tags! They are now available in my shop and are my gift to you to Thank You for all your on-going support!!! I'll be offering a New Design every month (this cute little guy looks great with our 2014 Calendar!!) and starting this January you will also be able to receive a Free Desktop, Iphone, Ipad graphic as well! The best way to know about these FREE items is to sign up for our newsletter (@ the bottom of the page) !!! Merry Christmas! I made these Wiches Fingers last Saturday for a Halloween Party and they were a big hit. Really simple to make! I used this recipe. Instead of almonds, we used pistachios. You may want to make them a little thinner because they do spread out a bit when they cook. I added a little green food coloring to make them extra creepy! I hope everyone has a very safe a fun Halloween this Wednesday! Monday's Mood Board - Update! It was my concept illustration for my daughter's bedroom make-over. A few things have changed but I'm getting very close to finishing it all up...just a few more pillows to sew and items to hang! Instead of the black strped drapes I decided to create my own fabric which will be available in my shop next week. My sweet mother and I sewed the window coverings last week and I just finished these painting for above their bed. I still plan on painting a boarder behind the paintings but you'll see all of that when I reveal the entire room. I did one with three roses and the other with two and added crystals to the inside of the roses. Hanging on the wall but not quite complete...Make sure to come back next week and see the finished product! Monday's Mood Board...Spring Redesign For My Girls! The beautiful Spring weather always puts me in the mood to reinvent my home. Time to clear out the clutter and re-design. This time I’m focusing on my two younger daughters who share a room. When we built this home they were only 2 and 3 years old. They have since grown into lovely 12 and 13 year olds and the baby pink room is about to grow up. I’ve been consulting with them and they are giving me very little lead way in the design process. Raquel and Chyna picked the color palette. Dark Coral walls (I know-right?!?!) with accents in White, Black & Gold!!! Across from their beds they said they wanted a Bulletin Board “Wall” like the one seen in Kylie Jenner’s video. I also found this cute one on The Happy Home Blog, it’s not quite big enough for what we want to do but I wanted to share her idea with you. She shows you how you can make this yourself step by step on her blog. Something else I found on Pinterest is this super idea from The Vintage Treehouse. I love how she reinvents these old frames and lace to make jewelry holders. Behind their beds I was thinking of doing something like this lit canvas as seen on Apartment Therapy. The idea kind of sent me running down a bunny trail but instead I've decided to paint two large canvas’s with all our colors, to tie the room together. Behind the paintings I’m going to paint a black and white border on the wall to frame them. Rocky told me she really likes the silhouette pillows I made of them a few years ago, so I’m going to make new ones for them, trimmed in gold and backed in coral. I’ll also create a new heart pillow for them as well. Drapes will be a bold in black and white stripe and I’ll be adding a desk under the window with a funky chair of some sort. We already have a manikin. Her name is Lola and she’s super for belts, scarves and purses. Of course we’ll need a full-length mirror too…all of these ideas and more you’ll see unfold on the follow up posts. So there you have it. From my sketches to my Mood Board, that’s the plan for their room. I will be posting updates to this project as I hope to have it completed in the next couple of months! Mid Week Mini Mood Board...Candle Love! Some of you may know that I have two daughters that play Club Soccer. As much as I love being a soccer mom, the traveling can be exhausting. Recently we spent two weekends traveling to San Diego for State Cup. It’s a long drive from the Central Coast but we were lucky enough to be able to stay with my brother and his lovely wife instead of a hotel. After five hours of driving late at night we walked into their charming home with candles flickering and hugs all around. It made me realize how much I love candles and why don’t I light them more often? So when we got back I purchased some yummy candles for my home. Of course you need something pretty to put the candles in and I love lanterns. Places like Pottery Barn and World Market carry a large selection or you could be like Ohdeedoh contributor and DIY expert Katie Steuernagle (Courtesy of Design Sponge) and make your own out of spaghetti jars! Clever!! You can check it out here. It can also be as simple as making your own with a little sand and a tea light. Whatever your fancy, I recommend lighting a delicious candle or two this week and watch the atmosphere change in your home! You can buy delicious candles, I favor these by Zensual, at Stephen Patrick Design on Monterey St., downtown San Luis Obispo, right next door to the Bladerunner Salon & Spa. Introducing Our First Monday Mood Board! Well Hello Monday! Welcome to my very first Monday Mood Board! The idea came to me as I was photographing my products for my shop. I was wishing I had all the money in the world so that I could create beautiful room photographs that would show case my products…since buckets of money didn’t just drop from the heavens, I got a little creative instead and dusted off my watercolors and paint brushes from Waaaaay back In the day when I illustrated children’s books and greeting cards. Not that I don’t do sketches all the time for my design clients but that’s what they are…for my clients. When I design for them I’m designing what they want and helping them to bring their vision to fruition. Instead, this is an opportunity to just paint and put together a room design how I would want to do it…no budget…no limitation to color palette…just fun, little whimsical rooms. Another passion of mine is supporting independent artists so when I can, I will be including their wonderful work as well. All of these links are from companies in the US. My product is sewn right here on the Central Coast by incredibly talented seamstresses who had their facility shut down when production moved over seas. That said, yes, it costs a little more to make it here but I believe it’s worth it. I think if we can all do a little bit, then it will collectively make a big difference. Last of all we have to include some DIY projects in here and today I’ve included two projects from the very talented blogger, Miss Jackie over at her blog, Teal & Lime. The lampshade in the center of the room is made with stencils she created (I know, now that’s talent) and the shelf in the room is made from Stair Treads! How clever is that? The full tutorials are over at her blog along with lost of other inspiration. Thank you Jackie!!! And one more thing…yes, that adorable dog was up for adoption…since I started this last week, she has found a lovely home!!! Yay! But there are many more waiting, and if you're local, you can find a little furry friend for yourself at Woods Humane Society. So that’s it! You can follow my Mood Boards on Pinterest they contain all the links and a few other options that may have not made it into my Mood Board Illustration. (For instance there are some inexpensive options for some of the items shown here) Like this upholstered headboard from Ballard Designs vs a $40 decal headboard from What Is Blik. I’d love to know what you think and of course I would love it if you “Liked” my FB page. If you have a favorite piece of furniture or home décor product you would like me to design a room around, shoot me an email! My 2012 Calendar & Mod Moroccan Wrapping Paper Is Here! For the second year in a row I've been fortunate enough to be asked by Central Coast Printing to create a holiday wrapping paper! They do a beautiful job printing this paper on two sides and the paper is so thick and luscious! Simple & Sweet...Who Ever You Are, May You Have a Beautiful Life Together! Why am I doing this? Procrastination!!! I have a huge deadline and so far today I watched the Women's World Cup, made french toast for the family, went to farmer's market and now I just had to post this... On our way back from farmers market we kept passing these adorable, hand made wedding signs. I just thought it was so clever..this one was at the end of our street...I wonder if they would sell it to us since my husband's name is Bill?? One of my favorite little tricks in making a room have some unique character is using stencils. I'm not talking about grapes and ivy here, stencils have come a very long way. I love this simple Moroccan stencil from Royal Design Studio. (Looks great with my Mod Moroccan Collection!) This is a fantastic and inexpensive way to update your space...and besides, when you get tired of it, it's just paint! by Mari Robeson in Just Thoughts..., Kid Spaces!, Make & Create!, New News! For the past 9 years I have had the pleasure to choreograph the Finali at my daughter's elementary school. I usually have around 40 kids from Kindergarten to Sixth Grade. They are so sweet and do a great job every year. I love teaching children because, in their minds, they can do anything... I always expect the best and that's just what I get. So to thank them I give them a little sweet treat for working so hard. Since we are close to Easter this year, this is what I came up with! I LOVE Peeps! I'm having fun with my new tag - die cutter too...actually part of some new designs I'll be putting in my shop this April. Have a great show tonight! My 2011 Calendar Is Here And Fun New Wrapping Paper Too! by Mari Robeson in Delish Decor!, Make & Create!, New News! A couple weeks ago I was asked by Central Coast Printing to design their Annual Wrapping Paper. Since I already designed a 2011 Calendar I said, Sure!, and we printed away. They are now here and just stunning! The color is brighter than I could capture on my camera so just keep that in mind. The calendar is 8 1/2" by 14" and the wrapping paper is 24" x 36". The wrapping paper is printed on both sides on a deliciously heavy paper...I almost felt bad cutting it to wrap my presents...I think I'd rather hang it on my studio wall! I'm seeing these as great hostess or teacher gifts. They can be purchased here or just shoot me an email. Happy Holidays Everyone!!! At the beginning of this year I gave myself a project...to Thoughtfully Design my "own" home. I started in my garden, which hopefully we'll be able to tackle again this weekend, with soccer tournaments and a lot of California rain, my garden project has been slow going. So I turned my efforts inside...to my bedroom. It's challenging being a designer because there are so many choices. What is so simple for me to see for others, can sometimes be the opposite for myself. I'll tell you what though, when you get an email from the editor of a fantastic magazine and they say they'd like to see some room shots with your product in it...well, you figure it out real quick! The really fun thing was that weekend my niece, Shaunah, was visiting and we collaborated on what to put on the black wall, the wings or the screen from my window??? You can see what won below. So last week the amazingly talented Jenny Mallot of Live Artfully Productions took some fantastic photos of 3 of the rooms that I've designed with my new fabric (not even in my shop yet!) and we sent the pictures off to the editor...fingers crossed, hopefully they'll want to use a few of them. Until then it was a fun project that I'm happy to cross off my list for 2010! Also, I have to give a big Thank You to Nina Taylor, who sewed a tons of pillows and these drapes for me just in time for the shoot! More to come on the fantastic Sewing Atelier soon!!! !